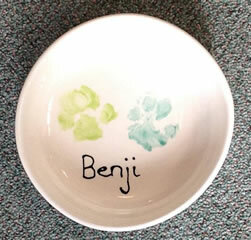 We have recently branched out into putting dog paw prints on ceramics! This has been really popular with people putting paws on plates, platters, mugs, plaques, tiles and Christmas baubles. 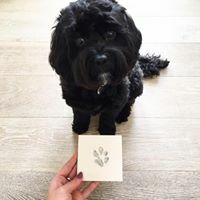 Not all the staff are comfortable doing dog prints and it is better to do them when the studio is quiet so please ring if you would like to do this. There are certain colours that are better for prints as you need enough pigment that it will show with just one coat but not so much that we can't wipe it off and start again if the print is unsuccessful. We can advise on colours when we do the prints. It is preferable that the dog's paws are clean and that the hair around the pads has been trimmed so it is not too fluffy. Please bring a towel or similar item if your dog is larger and will be sat on the floor for prints to be done. Small dogs are best sat on your lap.